About Hair Loss by Dr. Michael Lorin Reed — Office of Manhattan Dermatologist Michael Lorin Reed, M.D. 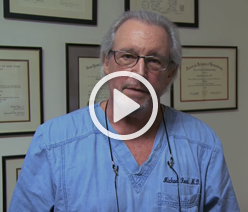 If you'd like to learn more about Follicular-unit hair transplantation (FUT), please watch this video of Dr. Reed performing the standard procedure. 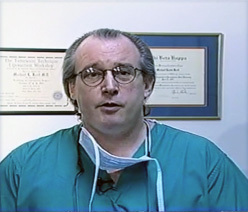 Another technique called Follicular-unit Extraction (FUE) is also performed in Dr Reed's office for patients who are not candidates for FUT. Demonstration of the follicular unit(FU) extraction procedure showing a closeup view of the donor site in the back of the scalp. Small incisions are made first using a very tiny ( 0.8mm ) circular punch followed by plucking them out with microforceps. 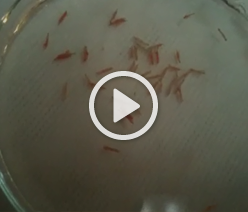 Demonstration of how the tiny hair bearing grafts are stored in chilled saline until the time for placement into the recipient sites. Demonstration of how the units are placed into the 18 gauge incision sites in the recipient zone. Dr. Reed Discusses Platelet-Rich Plasma (PRP) Treatment. Not all hair loss is the same. There are many types of hair loss in both men and women that have a variety of causes. However, the majority of patients have one (or a combination) of the Big Three conditions described below. This condition affects an overwhelming number of both men and women seen for treatment. Also known as Hereditary Hair Loss, it is seen any time after puberty with an increasing incidence with each decade of life. It becomes a serious cosmetic issue in about 20% of women. Medical and surgical treatment is available that can slow down, arrest and, in many cases, reverse this common condition. This condition is seen mostly in women and results when some kind of systemic factor(s) causes an excessive number of hair follicles to stop growing. It may be self-limited, such as after pregnancy or an illness or it may be persistent due to an ongoing systemic disorder such as anemia or thyroid imbalance. Treatment depends upon the underlying cause, which may not always be apparent. Also known as allergic alopecia, this condition is characterized by the appearance of well-defined “bald spots.” It may be limited and disappear without any treatment or it may be widespread and resist all forms of treatment. Although, most patients do well if they need to see a physician, a small number do not respond to any therapy and can even lose all their scalp hair (totalis) or all their body hair (universalis). There are a large number of less common or rare hair loss disorders. Some are easily treated and some have no treatment at all. Traction Alopecia - Loss related to hair styling/controlling. Trichorrhexis Nodosa - Hair breakage related to chemical and/or mechanical factors. Follicular Degeneration Syndrome - Traction Alopecia without obvious traction. Trichtillomania - Hair breakage caused by conscious or unconscious hair manipulation. Tinea Capitis - Hair breakage caused by a fungus infection. Folliculitis Decalvans - Hair loss caused by an acne-like scalp disorder. Scarring Alopecias - Permanent hair loss caused by inflammation that destroys the permanent upper portion of the hair follicle (example: Lichen Planopilaris). Short Anagen Syndrome - A hair growth disorder of dubious reality. Loose Anagen Syndrome - A hair shedding disorder seen rarely. Congenital Triangular Alopecia - A localized patch of permanent non-growth. Burning Scalp Syndrome - A shedding disorder associated with persistent burning sensations. The good news is that there are many hair loss treatments available to both men and women. They include non-medical, medical, and surgical approaches. Non medical treatment for hair loss includes many lifestyle remedies such as diet, exercise, and nutritional supplements. Medical hair-loss treatments are available for patients who have had little success or unsatisfactory results with over-the counter (OTC) therapies. Such treatments include the application of special topical custom made state-of-the art formulations. Systemic prescription-strength medications, such as anti-androgen enzyme and/or receptor blockers are employed when needed. Some types of cold laser devices can also be helpful. A variety of anti-inflammatory medications can be used for disorders caused by allergic and immune imbalances. A new treatment called platelet-rich plasma therapy is the latest addition to our therapeutic armamentarium. A blood sample is taken and the portion containing tiny particles called platelets is isolated and concentrated. This preparation is then injected into areas of thinning hair after numbing the area with a local anesthetic. The treatment has been reported to achieve an 80% success rate in both Female and Male Pattern Hair Loss. Surgical treatment is yet another option that has been gaining popularity among both men and women. Follicular-unit hair transplantation (FUT) is a safe and effective state of the art method to correct many types of baldness. This highly specialized medical procedure removes hair follicles from a donor area on the back of a patient’s head, and places tiny (1-4 hair) grafts into parts of the scalp that are affected by hair loss. The transplanted hair follicles will grow and fill in the bald (or thinning) areas. The latest transplant technique is called Follicular Unit Extraction (FUE) surgery. This is a much less invasive procedure than the conventional FUT transplant (which requires excision of a strip of scalp followed by suture closure). Instead, individual follicular units containing 2-3 hairs are extracted using a tiny micro punch device. The donor site heals quickly with no scarring and minimal discomfort. The procedure takes longer than FUT, but has a much easier postop period. There are advantages/disadvantages to both procedures that will be discussed during a consultation with Dr. Reed. To make an appointment for an individual consultation to determine whether you could benefit from medical and/or surgical treatment please contact our office at 212-888-2260. © Michael Lorin Reed, M.D. All Rights Reserved.